I love taking pictures, and I take a LOT of pictures, but they are invariably for someone else. They are work pictures, and whilst they are fun, they are not for me...so when I had the chance to work with a fabulous model friend and take some pictures for me...I jumped at the chance. 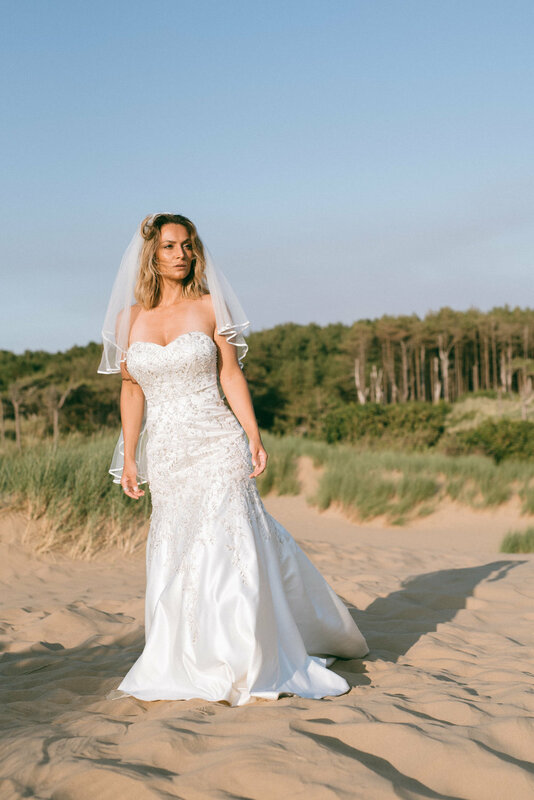 Off I went to Formby Beach, to meet the gorgeous Louisa, who had offered to model for me in her wedding dress. Her actual £1,500 wedding dress! And it was just as stunning as she is. As a professional model, it was a rare opportunity to work with someone who doesn't need directing, and I had a chance to play with my 'big flash' as I call it. It's portable and battery powered and is strong enough to overpower the sun! So despite the soaring temperatures, and sand dunes that would make those in the Sahara look small, sweat, heat, wind, sand...we got some pictures! But to add to the shoot Louisa told me that she was meeting the great Neil Redfern - a top notch photographer, whose workshops I have attended in the past - was going to be shooting her after - doing a 'trash the dress; style shoot...so I asked him if I could hang around and watch his shoot with her...just to see how he does his shoots, and maybe steal a few ideas and techniques off him for the future. I also managed to grad a few more shots of Lou whilst he was setting up his lighting and other gear! Two shoots for one! These so called 'styled shoots' or 'model calls' are important for us photographers. We can try out equipment, skills and techniques in a safe environment where a client isn't going to be worried about the outcome, and we can then offer these skills and shots in wedding shoots themselves. And we can see how others work and network and learn and share and grow. So whilst these pictures aren't the normal sort of shots that makes up this Shropshire Wedding Photographer's portfolio, they are a welcome addition to it. Whilst the scenery doesn't fit in with the average Shrewsbury Wedding, the poses that Lou did for me can be adapted and used and the lighting and skills can be transferred to a wedding or even a pre-shoot! I would LOVE to do a 'trash the dress' shoot, like in the pictures at the end of this set - so if you have a dress that you no longer need and want to trash in the best possible way...get in touch!